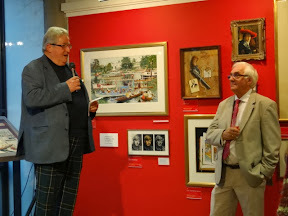 After all those months of preparation my exhibition was officially opened on Saturday afternoon by Sir William McAlpine. And I spoke for less than a minute! Lady McAlpine brilliantly organised the reception and produced what seemed like and endless supply of pink bubbly, ably assisted by her two young helpers, Katherine and Sally. The Henley Standard had, on the previous day produced a full page on my work and career, which included the embarrassing headline (quoting an American collector and admirer of my miniature portraits) 'A National Treasure'. A few paintings were sold. The first of which (to a lady as a present to her elderly husband) was a pencil drawing entitled 'Le Derrière de Joceline'. So that was Saturday afternoon. Later in the evening six of us were invited out to a lovely dinner at 'The Greyhound' - Anthony Worral Thompson's pub in Peppard. 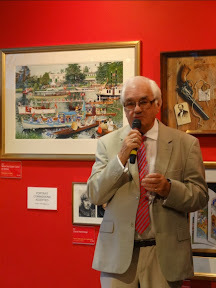 The following Thursday I gave a one hour's talk in the gallery to an assembled group of about 25 members of the River and Rowing Museum, which seemed to go down well. Incidentally, if you want to visit the exhibition it's on till February 2nd next year. And for a glimpse of some of the exhibits CLICK HERE to view each page of the catalogue where you can swipe right to left. Now I'm back to painting full time and have nearly finished one of a pair of rose watercolours. 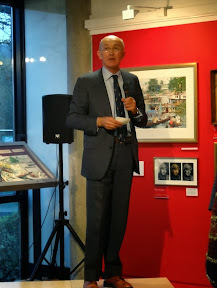 However this morning, together with my young friend, we went back to the Museum, this time to attend a very interesting talk by Mark Edwards - the master builder who led the team that built the Royal Barge - the Gloriana. 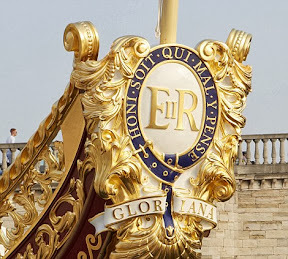 94 feet long, she was privately commissioned as a tribute to Queen Elizabeth II on the occasion of her Diamond Jubilee last year. 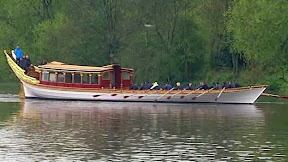 It was completed in record time and took part in the Jubilee procession on the River Thames. Really fascinating to follow the progress of construction. 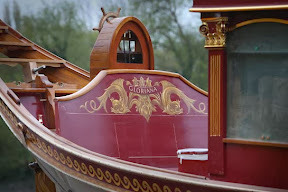 And especially interesting to see the fine work in gilding, carving, and painting by the wonderful craftsmen and women. 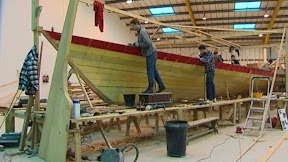 Mark Edward went into great detail about the construction of the Royal barge. I learned quite a lot. For example how they worked out what the length of the oars should be. 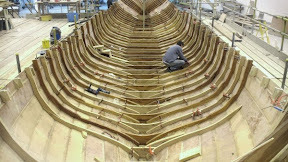 And how different lengths were needed to allow for the curvature of the boat. And because of their great length they were hollow. Which meant that, unlike solid wooden oars, curved impressively in a long arc as the boat was propelled along.